You know what they say about Thanksgiving — eat all the turkey and green bean casserole and cranberry sauce and pie, twice, then make cherry cheesecake monkey bread and eat that, too. At least that’s how we do/did this year. Because my husband works in the medical field, and we need medical people even on holidays, he worked on Thursday afternoon so I ended up having two Thanksgivings: one on Thursday with his family and one on Saturday with mine. My belly = SO FULL, and my heart = so thankful. And nestled right in between the two days of festiveating was the making of (and, also, eating of) this monkey bread. Please excuse me while I collect myself as I think back on those fond memories of eating said bread warm from the oven with cherry pie filling and cream cheese icing and soft, pillowy, baked-from-scratch pull-apart dough and GAH. Maybe we all need a moment. Usually I get pretty excited to make monkey bread for the aforementioned reasons plus butter plus sugar, but I was extra excited this time because my family was coming into town and a) my mom’s favorite flavors include cherries, cheesecake and monkey bread and b) I could share this gigantor Bundt with other people, which is my favorite pastime when I bake things (not that I’d have any ol’ problem polishing off this bread on my own, OBVI, but you know, it’s nice to have help). To my surprise, even my sweets neutral/meh-feeling husband, dad and brothers ate it with gusto for coffee time (my family drinks coffee by the trough, so this is basically an all-day thing) and dessert time and even brunch time the next day. This is exactly the kind of bread I enjoy making around the holidays, too, because while it does take a little extra TLC than the normal loaf, that gives you more time to turn up those Christmas tunes and get your hands dirty in flour, sugar, spice and everything nice. When it’s snowing outside and I’ve got even an iota of free time, I bust out my Red Star yeast, my baking pans and rolling pins and get to work. It’s the best kind of therapy, especially when I know the end result will be enjoyed by those I love. Feeling a homemade variation of the cherry pie filling I used? Go for it. Want to add some chopped dark chocolate in there, too? Yasssss of course you do. Hankering for a scoch of bourbon or brandy in that cream cheese icing? You do you, fren. You add that scoch. It is the merry holidays, after all. And on that note, I’m off to nurse my turkey hangover with what few little bites are left of this monkey bread plus coffee plus more baking plans that include all the Christmas-y carbs. GET EXCITED. Psst — For more baking tips and recipes, head over to Red Star Yeast or visit their Facebook, Twitter, Pinterest and Google Plus pages. Psst again — I’ve got a neat-o sale going on for my eCookbook, “Quick Bread Love.” Use code HOLIDAYS at checkout to get 30% through Dec. 21, awww yeah! In a small bowl, dissolve 1 tablespoon sugar and yeast in warm water. Let sit 5 to 10 minutes until foamy. In a large bowl or bowl of a stand mixer, combine 3 cups flour, dry milk powder and salt. Add milk, melted butter, egg and yeast mixture; stir until a dough forms. Turn dough onto a lightly floured surface and knead by hand 10 minutes, adding just enough of remaining 1 1/4 cups flour until dough is smooth, elastic and slightly sticky; OR, knead dough 5 minutes in stand mixer using dough hook on medium speed, adding just enough of remaining 1 1/4 cups flour until dough is smooth, elastic and slightly sticky. Shape dough into a ball and place in a large, lightly greased bowl; turn to coat. Cover bowl with plastic wrap and let dough rise in a warm place 1 to 1 1/2 hours until doubled. Punch down dough. * Divide dough into 1-inch pieces; roll each piece into a ball. Dip each dough ball into melted butter, then roll in graham cracker-sugar mixture. Place in prepared pan. Once bottom of pan is covered with dough balls, spoon half of cherry pie filling over top. Top with another layer of dipped and coated dough balls. Top with remaining cherry pie filling. Top with remaining dough balls. Meanwhile, heat oven to 350 degrees F. Unwrap pan and bake 40 to 45 minutes until bread is a very deep golden brown on top and filling is bubbling. Cool in pan 10 minutes, then carefully invert bread onto a serving plate. *NOTE: At this point, dough can be refrigerated overnight for use the next morning. Just punch dough down, shape into a ball, and return to greased bowl. Cover with plastic wrap and place in fridge. The next morning, let dough sit in bowl at room temperature 45 minutes to 1 hour before proceeding with recipe as directed. This cake is so freaking yummy looking. 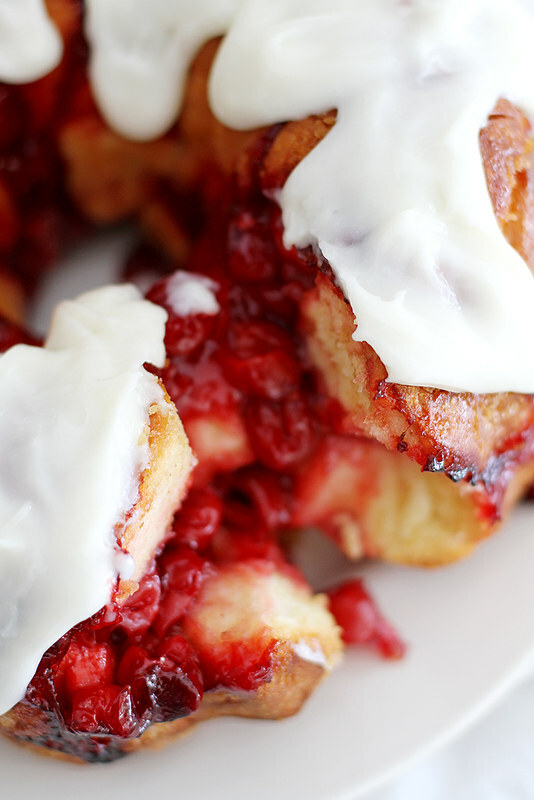 I just love cherry cheesecake, so this bread is right up my alley! Now the monkey bread = awesome! This is too perfect for your occasions! I could not think of a more seasonal Flavour combo to go with the best sharing bread. So jealous you had two Thanksgivings. The more the merrier! I love the way you do Thanksgiving! Admitdedly, miine was somwhat similar – a Friendsgiving on Wednesday and a family Thanksgiving on Thursday, followed by eating all the sugars I could get my hands on. 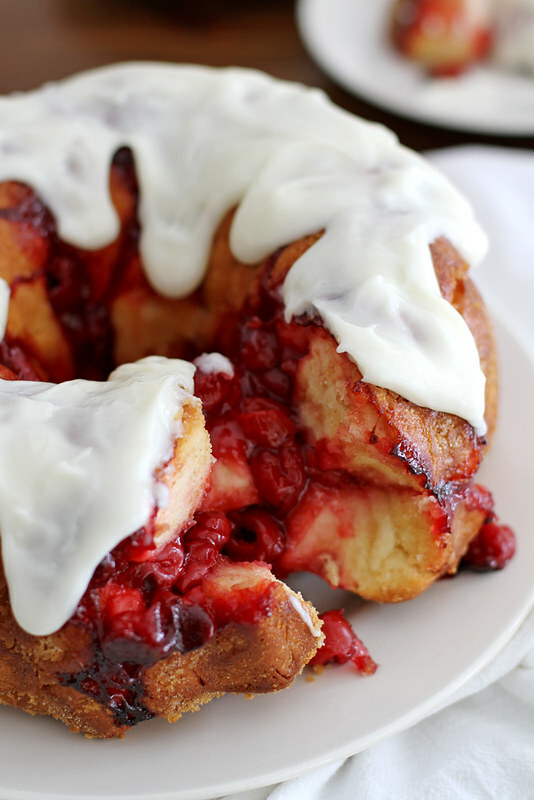 Had there been a cherry cheesecake monkey bread in a 10-mile radius, I’dduh et that whole thang, too! So glad you had a wonderful (two) Thanksgiving(s)! It was one of the best desserts, snacks, breakfast sides I’ve ever eaten! Dinner wasn’t too shabby either! Say what! UH-uh, you did not go there. Oh man, you totally went there! This looks spectacular! Pinned! I think we’re the same person. My boyfriend is in the medical field. He’s soOoOo neutral about sweets. I love sharing my baked goods with our neighbors & friends. It keeps my hips really happy. I seriously could not wait to pin this deliciousness!! Aww yeah, you really know how to do Thanksgiving!! FRIEND. This bread looks wicked! I’m so in love with this madness – we LOOOOOOOVE monkey bread around here!!! Oh my gooooodness, this looks soooo delicious! My friends and I would devour this in record time. Pinned! Wow, what a fantastic idea for monkey bread! 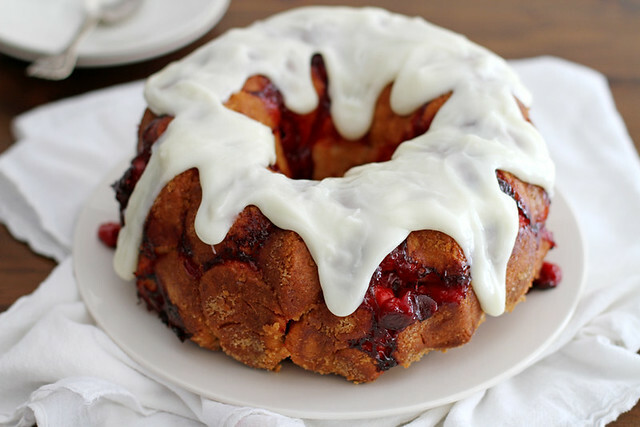 I’ve never made monkey bread, but now if I do, it must be filled with something like cherry cheesecake. 🙂 This is so fun for the holidays! Oh my! 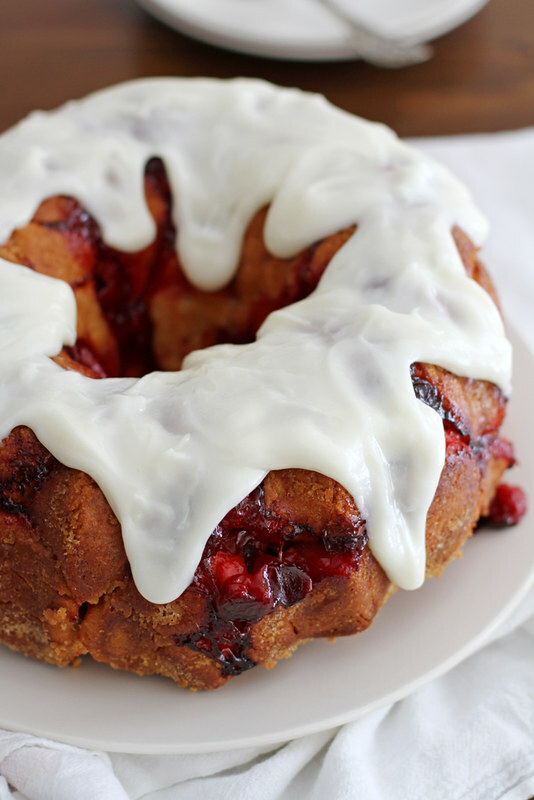 It’s been ages since I’ve made monkey bread … and with this cherry cheesecake flavor!? Sounds amazing! Perfect to enjoy while decorating the house for christmas! WOW! This bread looks so magical! Soooooo full from Thanksgiving still, BUT I go totally go to town on some of this!! WUT?! This monkey bread is what dreams are made of.